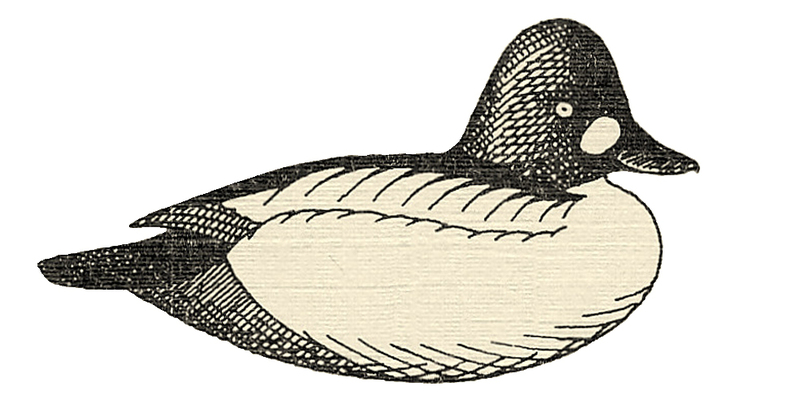 I just could not name this page Scaup or Greater Scaup – and not even Bluebill – what with me being a native Long Islander and all. Broadbill were truly abundant on Great South Bay during my youth – and certainly during my Dad’s heyday. It was almost unthinkable that at least a few would not pay a visit if you were rigged along the shoreline or on a point, especially if the water had some depth. 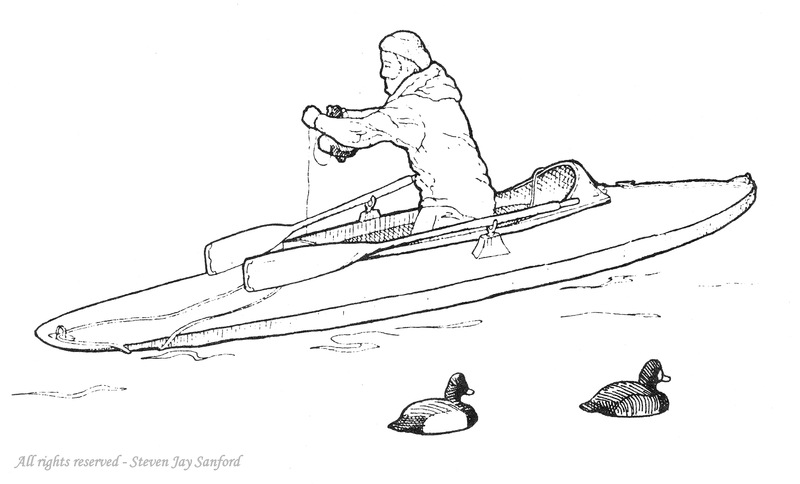 And, we mostly hunted from a scooter – the indigenous open bay gunning boat made for hunting over the ice or out in deep water. Chances improved markedly out there – if you were near their feedbeds. 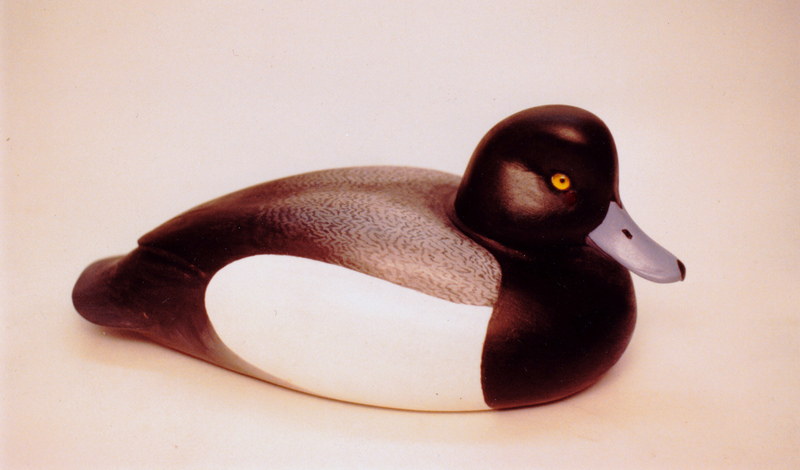 The decoys were mostly Broadbill, but we included a handful of Cans and Whistlers – mostly just to entertain the gunners. But Broadbill were what we saw most. In flocks easily mistaken for clouds – except they might be heading upwind – Great South Bay and other Long Island waters were one of the main wintering areas for these wonderful birds that traveled all the way from the Yukon and even Alaska to dine on our clams and eelgrass throughout the winter months. 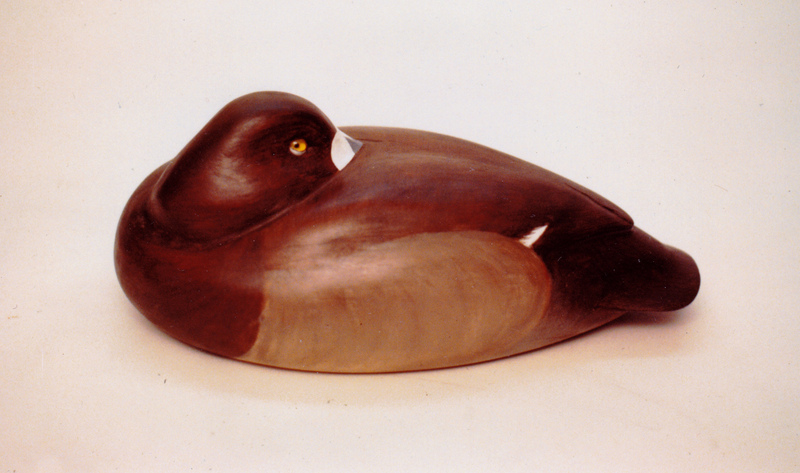 The Hen Broadbill above – poor color rendition because the print is about 30 years old – is a “floating decorative” – wherein the carver tries to copy every detail of the live bird through carving, texturing and painting. On one bird – also a Broadbill – I carved the entire tongue on the lower mandible and then closed the bill…. I learned a lot doing 3 or 4 birds in this style – but mostly I learned that it’s not for me. Although I admire the accomplishment of those who carve floating decoratives, I have found that all the texturing and inserting of feathers takes the fun out of the process for me. 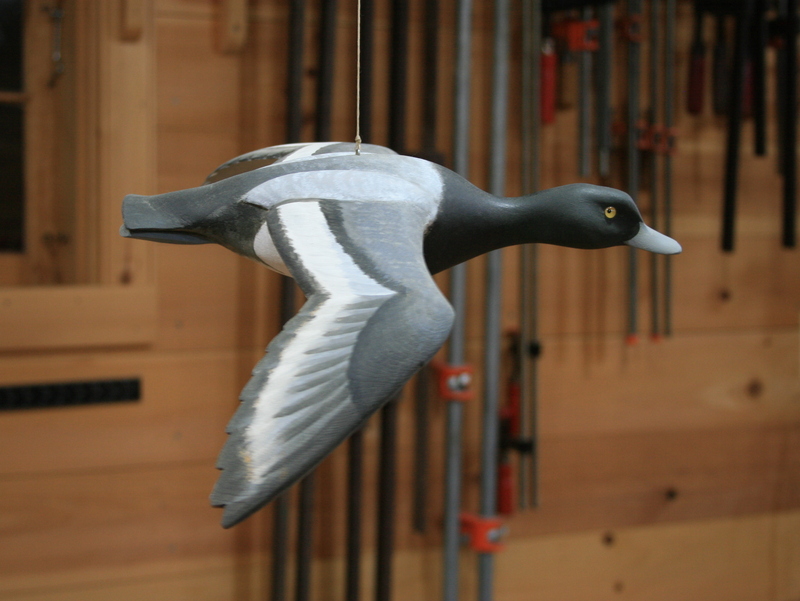 This Drake Broadbill (above) is a hollow gunner, carved from White Pine. It got a ballasted keel after this photo was taken. The back is stippled – instead of combed – to imitate the boldly vermiculated, black-and-white herringbone pattern – a look that never fails to excite my eye up close. I only stipple a little green onto the head – to suggest the Greater’s iridescent sheen – when the spirit moves me. 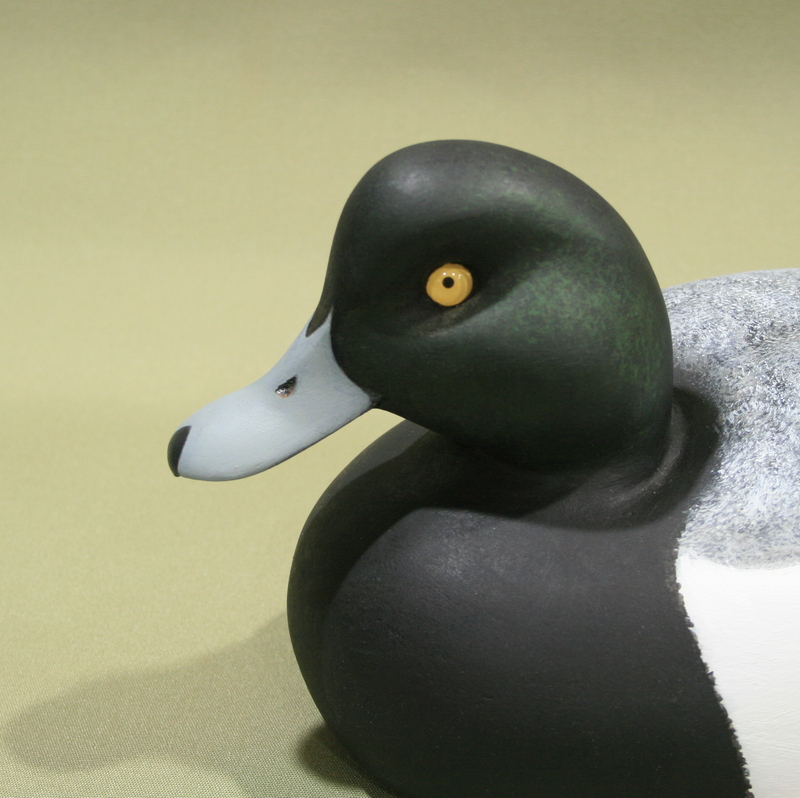 It was certainly rare that any real working decoy would have anything but a black head. 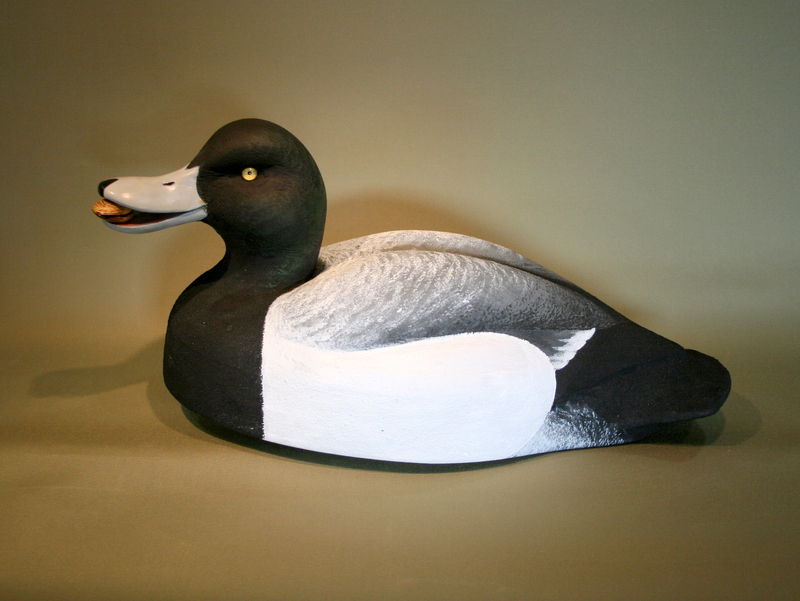 This Drake Broadbill (above) is a hollow “mantel-piece” bird – carved from White Pine and finished in oils. Destined for a life indoors, it has no keel. And – more important – I added details in the paint that have no place in a gunning rig. 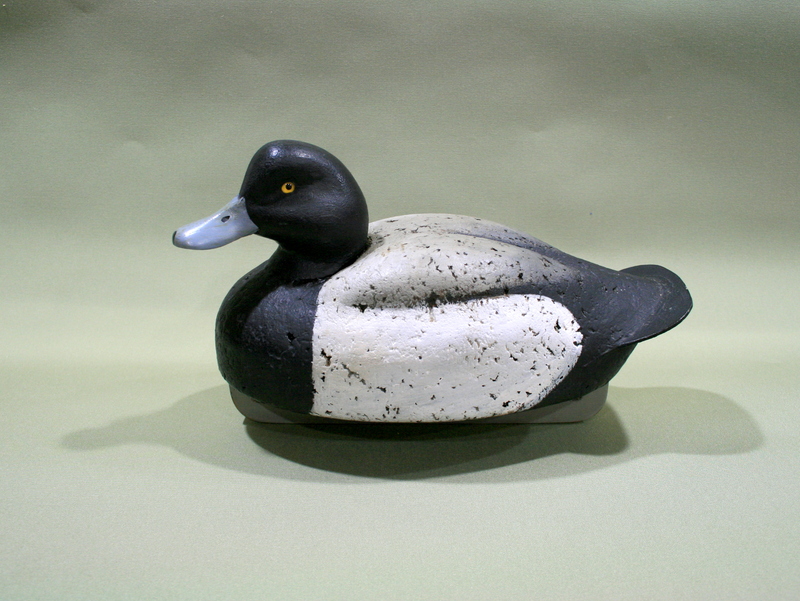 This Drake Feeder – I always wanted to carve one with a Little Neck (smaller hard clam) ‘twixt its jaws – was made to be the lead bird in a trawl. Its body is, I think, 21 inches long. The idea is that it takes lots of flotation to resist the pull of the lead anchor. I think it is the very first “foamer”I ever made. I used insulation board, a plywood bottom board, and a White Pine head. I think the Hard Clam (quahog up north…) was carved from a cut-off. The bird on the left is the life-size gunner pictured above. This is a pair – hollow White Pine – that I carved in the mid-1980s. I should carve a pair of gunners based on these. 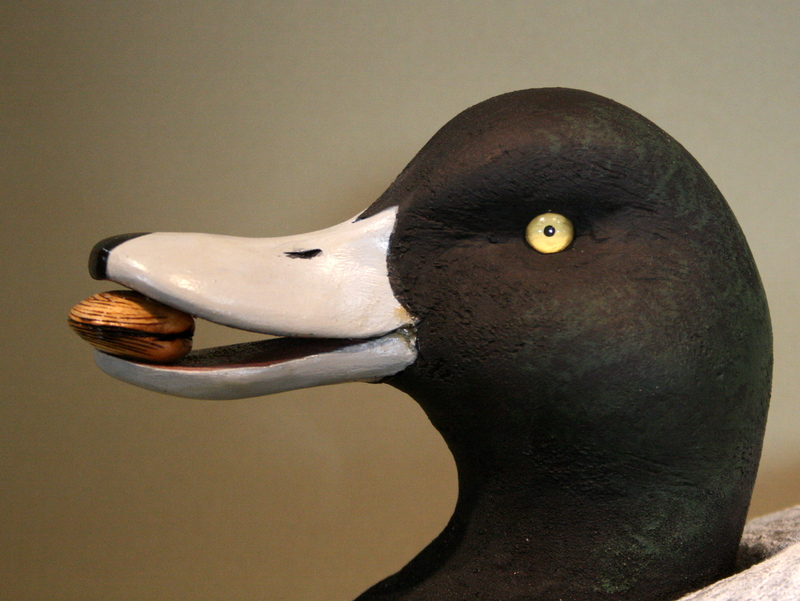 But first, I should probably carve a life-size decorative with a clam in its bill. 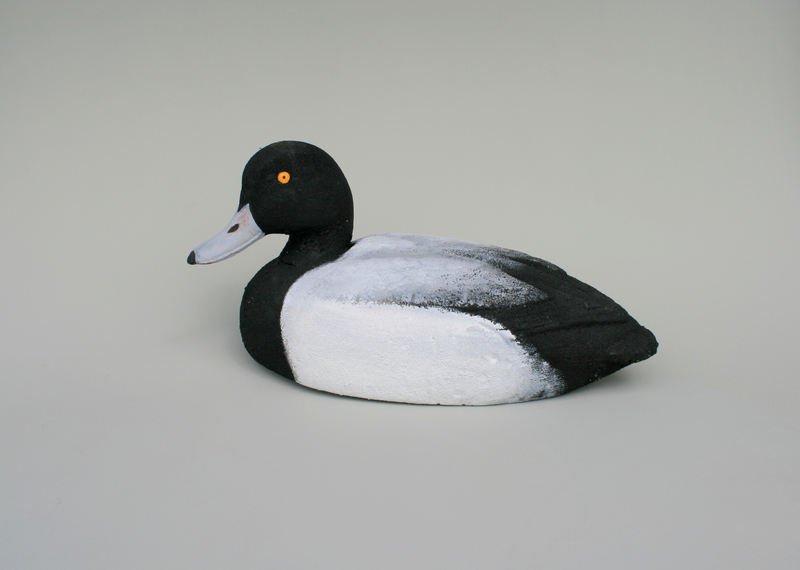 These birds are Herters Model 72 “Bluebills” from the 1950s – the oversize styrofoam bodies with the molded plastic heads. I have about 40 of these and are rehabbing them as I get time. I coat them with marine epoxy and then fine sawdust. Because the sawdust absorbs the wet epoxy, it cures hard and gives a nice base for paint – and a tough skin to protect the soft foam. To suggest the gorgeous vermiculation on the Drake’s back, I stipple some Black then some White over the Grey base – with a beat up “throwaway” (chip) brush. 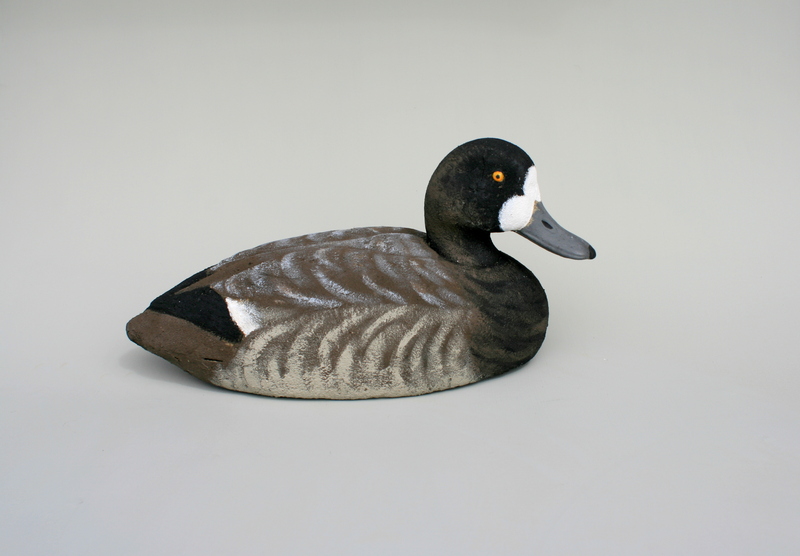 This Drake is made from “black cork” with a plastic tail insert and ballasted keel. 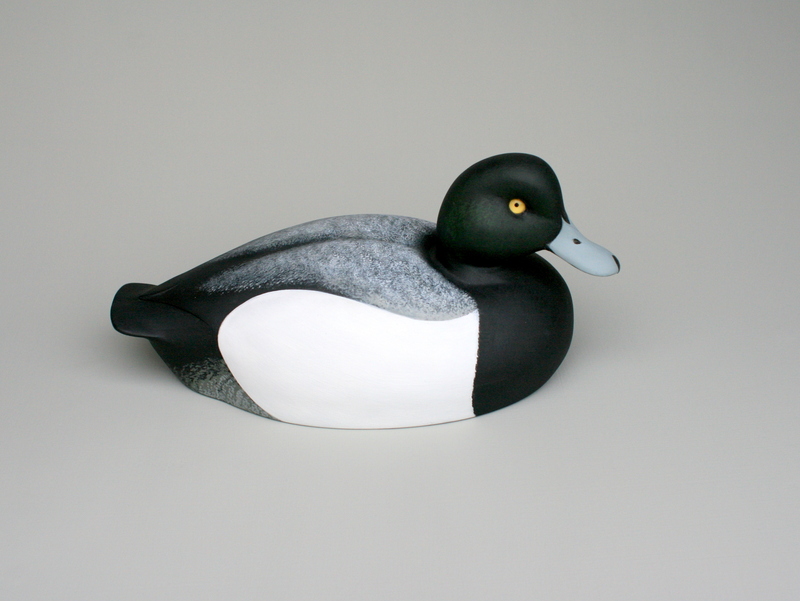 It took a Blue Ribbon in what I believe was the first and only Hudson River Decoy Contest in the mid-90s. I made this half-size flyer for my Dad – in what turned out to be his last year, 2011. I had planned it for his birthday in April but I was not quite satisfied with it – I planned to carve another. He passed away before Father’s Day came around, so, when I knew he had but a few days left, I brought it with me and hung it from the TV arm in his hospital room. His oxygen mask made speaking difficult but I know he liked it – he gave me the OK sign in his inimitable way. This Broadbill now flies tirelessly over a bench in my shop. Never happy with the head shape on my Dad’s bird, I carved another with a fuller crown – and a more stylized paint pattern. These Flyers can stand on a shelf or hang from a ceiling. 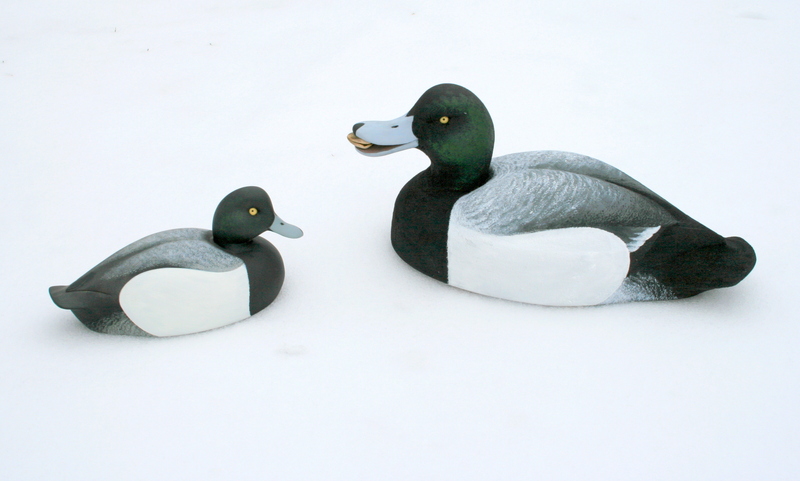 This pair (above) was made from tan (aka “white”) cork for Illinois carver Pat Gregory. 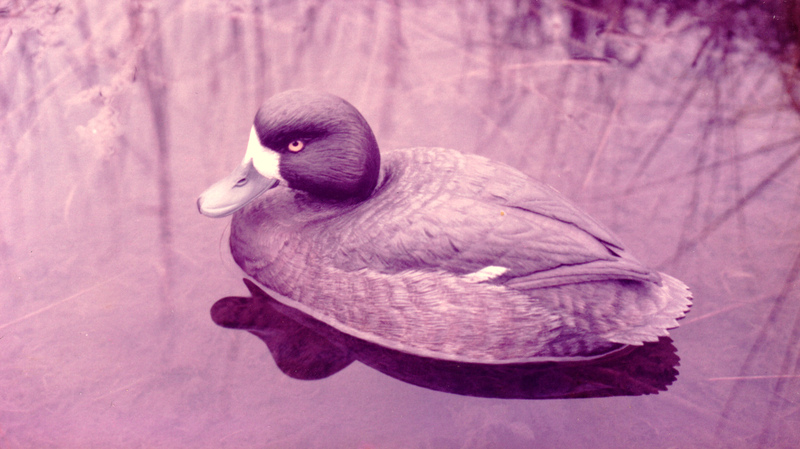 The Drake was my first “cross-head” – and the Hen had to be a “sleeper” – because big rafts of Broadbill always seem to have plenty of birds taking a little nap. And here is our “Broadbill-getting Machine”. It’s a 15’9″ Great South Bay Scooter built by Benjamin Hallock of East Moriches, probably in the 1920s or 30s. It still sees the water from time to time. More about it in the Boats & Canoes section of this site.